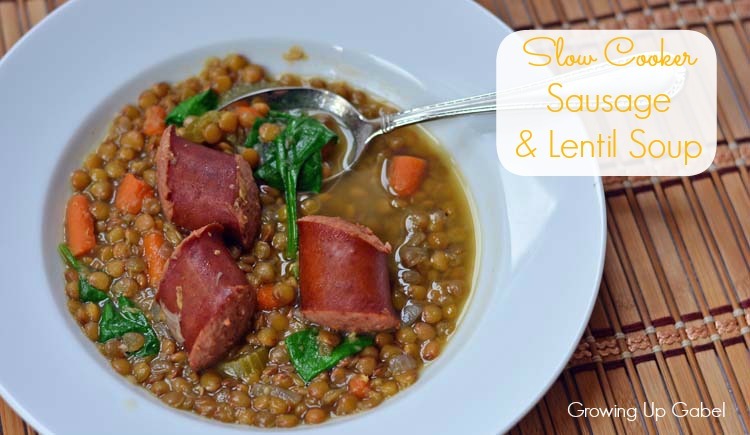 Lentil soup with sausage is an easy, filling, and delicious meal. Cooked in the slow cooker and packed with health ingredients, this lentil soup is a family favorite. I fell in love with lentils and lentil soup when I worked for a travel company in my 20's. I spent a lot of time traveling in the near east where lentil soup is as common as chicken noodle soup is in the U.S. I was very happy to discover that lentil soup is very easy to make and I began re-creating my favorite lentil soup at home. 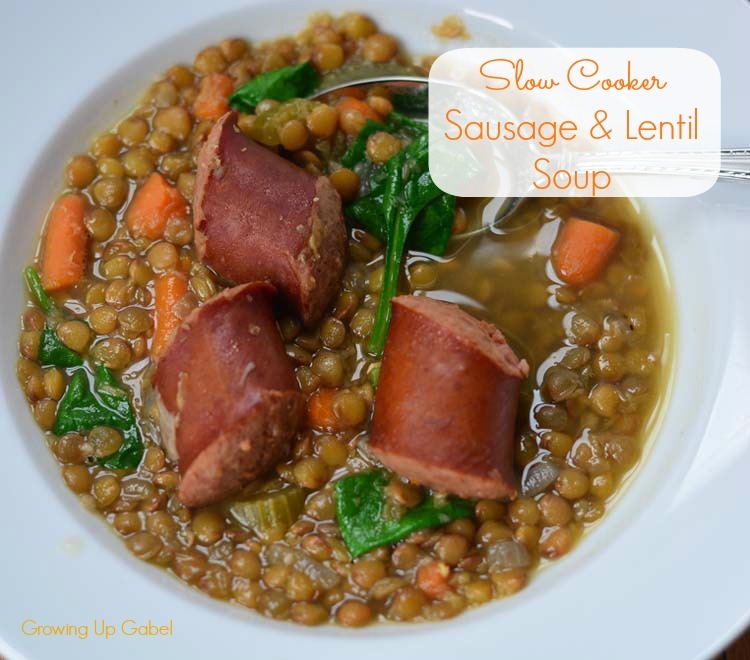 I have a few different versions of lentil soup, but this slow cooker sausage and lentil soup is by far my favorite. 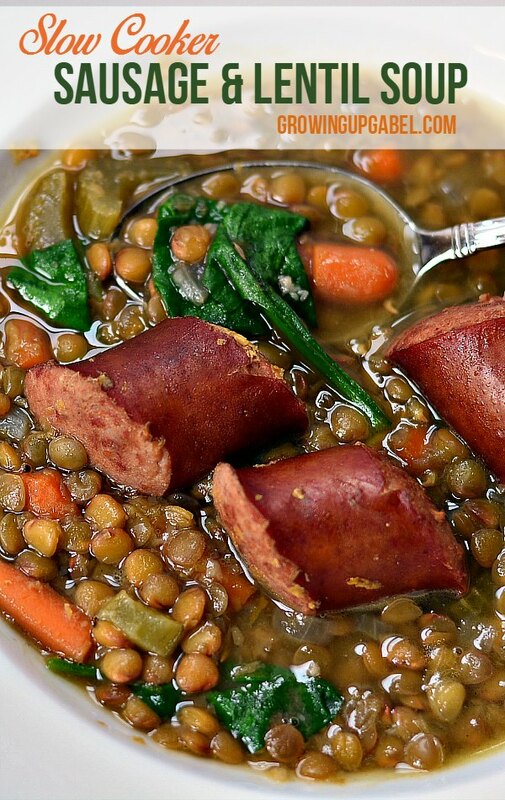 The sausage adds a new depth of flavor and interest to the lentils. You can use any sausage you like in this soup. 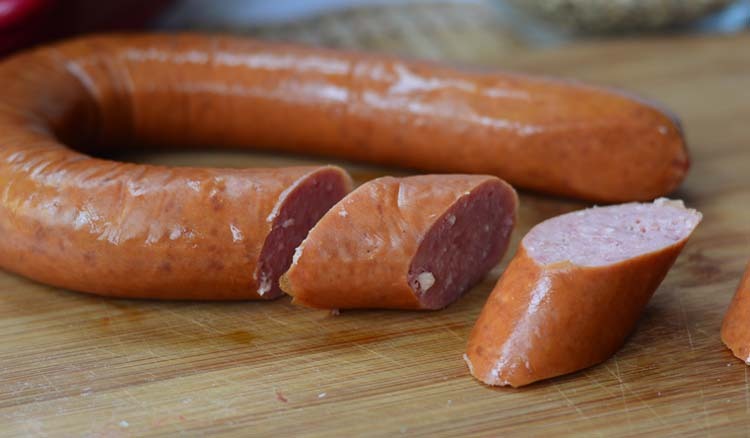 In the past I've used a spicy Italian sausage, but I love the taste of smoked sausage in it, too. I loved the smoky flavor the Angus sausage gave the lentils as they simmered all day long in the slow cooker. I only used one package of the sausage in the lentil soup, but you could definitely use two. The soup felt a little lean on sausage, which isn't what I was going for at all. Aside from the lentils, this soup calls for basic ingredients you probably already have on hand. I usually use homemade chicken broth when making soup, but a boxed or canned broth works, too. If you've never cooked with lentils, you just want the basic brown lentils. 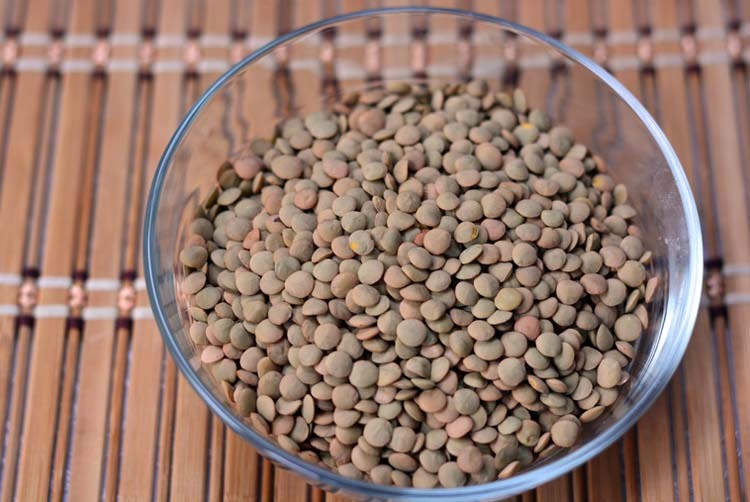 Lentils are very inexpensive and full of great nutrition. The lentils will expand similar to beans or rice when cooked and should be nice and soft when eating. The best part of this soup is that you can let it simmer along in the slow cooker all day long. I love to serve homemade soup with a nice loaf of fresh bread for lots of dipping. In a pot or large frying pan, heat a Tablespoon of oil. Add sausage and onions and saute for a few minutes. Add garlic, carrots and celery and continue to cook until onions are clear. Put contents of pot/pan in to the bowl/crock of slow cooker. Add lentils and chicken broth. Cover and cook on low for 4 hour or on high for 2 hours. Stir in baby spinach, salt and pepper just before serving. Just put this in the crockpot. Concerned the only seasoning is salt and pepper. Has anyone added anything else? The sausage adds a ton of flavor as it cooks! So I made this soup today— Except I used ground Hot Italian sausage… so amazing! —just exceptional flavor! Now looking through the recipe again I realize I forgot to add the Spinach to it! Sure didn’t hurt it—And I didn’t miss it! Didn’t need any additional seasonings.I will add spinach to my leftovers. It will make this fabulousness Go a long way further! I have made this at least four times now. It is amazing. Thank you so much for a hearty recipe that my husband and I love. I’m so glad you guys love it! could I sub kale for spinach? I have never cooked kale in a slow cooker, so I’m not sure. Your Slow Cooker Lentil and Sausage Soup will be delicious! Thanks so much for sharing your post with us at Full Plate Thursday this week. Hope you have a great day and come back soon! Just a newbie question- should I pre-cook the lentils or is this recipe made for them to go in straight out of the bag? No need to pre-cook them! They will cook right in the soup. Looks great and I love smoked sausage. Thanks for the recipe. Thank you for sharing on Merry Monday! Hope to see ya next week! Accidentally set it on high for 4 hours instead of low or 4, but it’s delicious nonetheless. Forgot to add I used turkey sausage. I would guess that your slow cooker is not working properly. While it’s possible that the lentils would still have a bit of a bite, the carrots definitely should be cooked through at 3 hours on high. How many does this soup serve? I would say it serves 4. Great soup! I’m making it for the 4th time tomorrow. I’ve made it with different sausages and they all have been delicious. Freezes well in individual sizes, take out of the freezer the night before and ready to heat up for lunch the next day. The weather is getting colder, and as a college student I’ve been getting homesick, and nothing cures the pair of those better than soup. I was torn between this and a chicken quinoa soup, I went with this because it seemed the heartier of the two and had more much-needed iron and it was terrific! 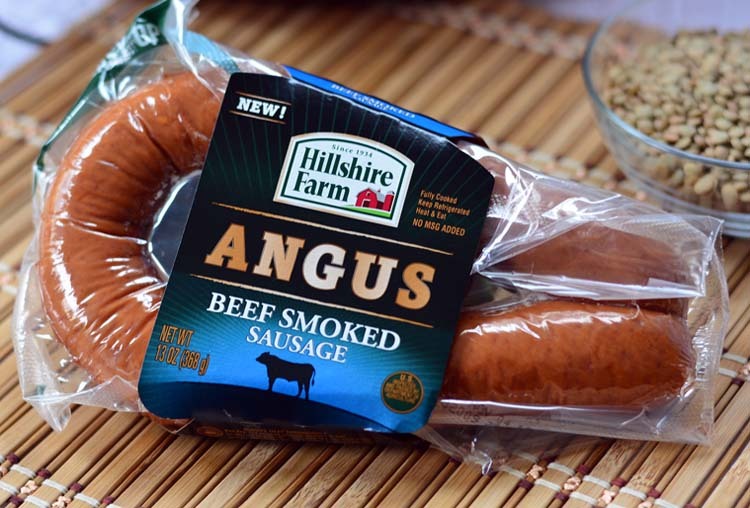 At home we cook with Hillshire Farm Smoked Beef Sausage a lot, but the store was out, so I got one with a combination of beef, turkey, and pork (which was terrifying. I hate mixing meats). I’ve also never cooked with or eaten lentils. Anyways, this was terrifically filling and warm and smelled amazing cooking (I made it on the stovetop). It also reminded me of my moms red beans in rice, I’m not sure why. I’m so glad you liked it. It’s one of my favorites. I have a friend who also hates to mix meats so no bacon cheeseburgers! Lentils are a great source of protein on a budget. I learned to love them traveling in the Middle East. I’ll have to post my koshari recipe for you to try. It’s an Egyptian street food made with lentils and one of my favorite foods ever. Thanks Camille for the nice and easy recipe. Thanks for the recipe. It was very cold here today and this was enjoyed by everyone. The only change I made was to substitute with a different sausage. Delicious. Made this soup last weekend, didn’t have the smoke sausage on hand so used hot sausage links instead, turned out great! Freezes well too, put into lunch portions and froze for future meals. Thank you! I love this soup with a spicy sausage, too! It’s fun to mix it up and get a different flavor. Glad you liked it! I’ve been meaning to find lentil recipes because they are PACKED with protein. This dish sounds delicious and is perfect for this cold weather! Thanks for sharing. My husband makes an amazing lentil soup. Yours looks great, too. We’re still too hot in Florida to eat much soup, but hopefully come January we’ll have a few cold days! Oh that lentil and sausage soup is definitely mouth watering! 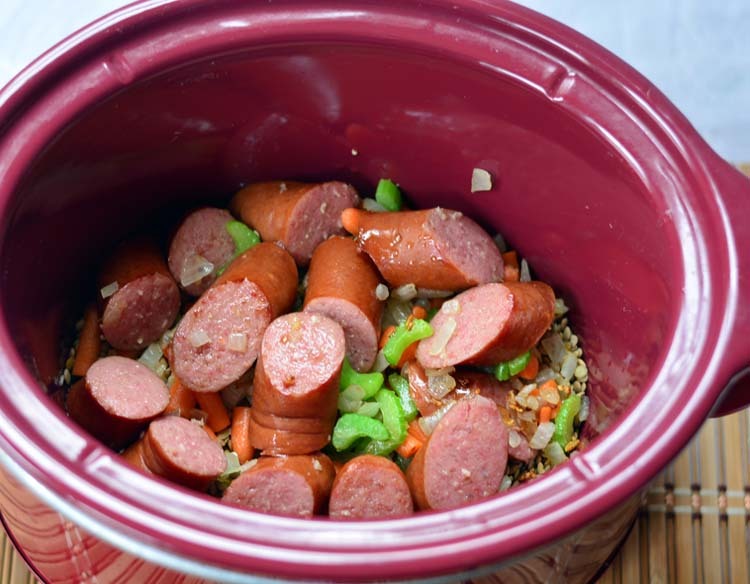 What a neat idea – I love adding lentils to my soups and stews but have never thought of putting lentils and sausage together! Definitely bookmarking for future reference! This one looks super yummy, too. My husband will try anything if it has sausage in it. Might be the only way I can get him to try lentils 😉 I’ve enjoyed looking around at your recipes. 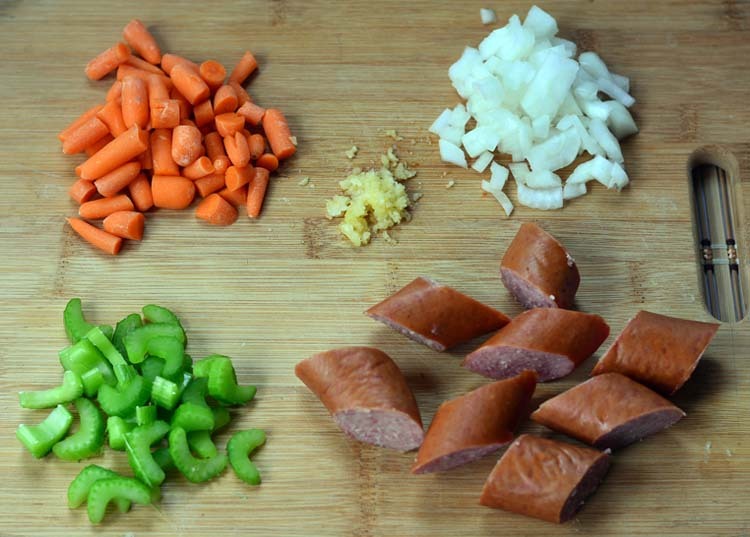 You could just skip the sausage and add in some red pepper flakes if you want heat. It would still be yummy! I have been “currying” everything lately! I’ll definitely have to try that recipe!